We never thought about how art should smell before seeing “Take Your Time,” but our most neglected sense is essential to our favorite works by Olafur Eliasson. The Danish-Icelandic artist drapes reindeer moss, which has a funky but not unpleasant odor—who knew?—over part of a gallery at the Museum of Contemporary Art for his installation Moss wall (1994). Soil quasi bricks (2003) covers another wall with thousands of hexagonal lumps of compressed earth. (They smell, well, earthy.) Both works bring the outdoors, specifically the landscape of Eliasson’s native Scandinavia, into the museum, counteracting the usual sterility of the MCA’s blank, white-painted galleries. 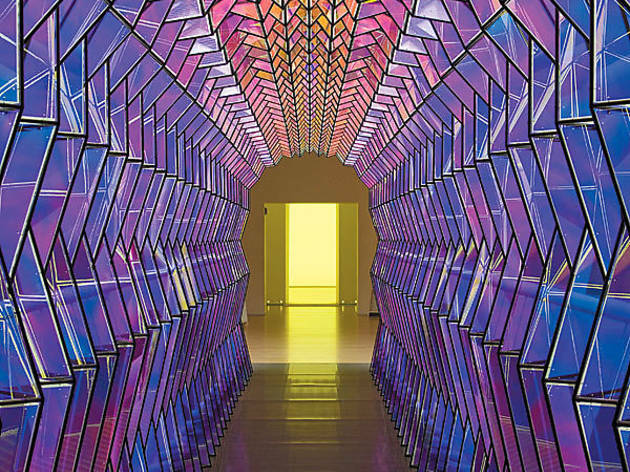 Eliasson’s attention to sensory experience gives viewers permission to focus on themselves—which may be what makes this 15-year retrospective so engaging. (MCA director Madeleine Grynsztejn curated “Take Your Time” for her previous employer, the San Francisco Museum of Modern Art.) The artist’s primary interest seems to be how we see. His Room for one colour (1997)—actually, a hallway—is so yellow it hurts: The piece’s intense “monofrequency lights” wash the color from everyone who enters the space, making them look as though they’ve stepped out of a black-and-white film; for several seconds after you escape, blue afterimages dance in your eyes. The light-oriented projects Eliasson completed after 2000 are (literally) less painful to contemplate. The mirrored Inverted Berlin sphere (2005), for instance, comes off as a giant disco ball. 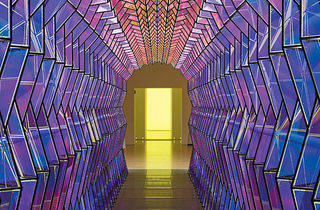 One-way colour tunnel (2007, pictured) transforms the passage from one gallery to another into a kaleidoscope, to the delight of the children walking through it during our visit. The artist saturates his circular 360° room for all colours (2002) in warm pinks and soothing blues, generating such effective color therapy that we lingered there until other visitors gave us funny looks. In a video on view in the show’s supplementary Idea Lounge, Eliasson calls his projects “experiments.” A display of his chipboard, wire models and prototypes aims for science-world street cred. We have to wonder, however, whether the simple visual pleasures offered by the artist’s light-oriented works are more meaningful than those of, say, a Pink Floyd laser show. The most memorable pieces in “Take Your Time” are those that transgress all norms of exhibition etiquette, importing fragrances, dirt or water—in the case of Beauty (1993), a spot-lit mist—into the museum. Moss wall evokes Scandinavia more powerfully than Eliasson’s dozens of photographs of rivers, caves and other natural features of Iceland, which fill one room of the show. True, the photos reflect an admirable grasp of color and composition; in The island series (1997), the artist plays an amusing visual trick, increasing the size of his prints to the match the size (or rather, the nearness) of his rocky subjects. But we’ve seen this privileging of sight before. It’s also the discomfiting works in the show that leave the strongest impressions, such as Room for one colour and Ventilator (1997), an oscillating electric fan that Eliasson hangs from the ceiling by a cable. The fan swings back and forth and around, rotating on its axis. It emits an alarming drone and comes precariously close to visitors’ heads, which the MCA’s exhibition brochure describes as an attempt “to disrupt and activate the museum’s interior architecture.” After a while, just as the Moss wall encroaching on the MCA’s staid light fixtures compels you to re-evaluate the museum’s normal ambience, the mesmerizing fan forces you to notice a mundane corner of the building’s first floor. Ventilator’s reliance on sound and a found object distinguish it from every other work in “Take Your Time,” so we wish Grynsztejn had provided more information about how Eliasson developed this piece—and why his practice later went in a more polished and pleasant, but less challenging, direction.